Living the Infinite Way is one of the four foundational books of the Infinite Way teachings. Joel Goldsmith recommended that new students begin with this book, together with Practicing the Presence. 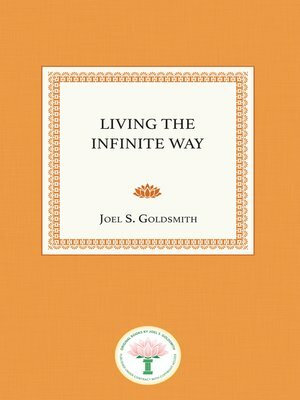 In Living the Infinite Way, Goldsmith awakens the reader to the possibility that the presence of God is within every individual, and that one can live by that Presence and enjoy a more harmonious, loving, and abundant life. The book focuses largely on the nature of God, for as Goldsmith says, "The writings of The Infinite Way contain hundreds of truths, but actually there is only one truth that we must know. This one truth is the nature of God. Take this one thought into meditation: What is God? What is the nature of God? What is the character of God? What are the qualities of God? What is the true God—not the God we were taught to worship as children, or that we ignorantly worship? Try to empty the already too full vessels, because they cannot be filled with the new wine. Even if you are seventy, empty your old misconceptions and be willing to begin all over with the admission that you do not know God or you would be showing forth more of God's grace. Forget all that you have thought or been taught about God and start afresh with this question, 'What is God?'" Goldsmith answers these questions about the nature of God with "the letter of truth," explaining that when one does not know the correct letter of truth, it is difficult to acquire the consciousness that leads to the God experience. But, he emphasizes, we must do more than know the letter of truth intellectually. We must consciously realize these truths, and it is the practice of meditation that will lift us to that realization. Goldsmith goes on to give the reader basic instruction in how to meditate and enter the secret sanctuary of inner quiet, where we become aware of the presence of God. "Meditation," he says, "is the way by which we attain the kingdom of God, and then life is lived by Grace. The ultimate of meditation is a state of complete silence within." Living the Infinite Way thoughtfully ushers the reader along the first steps in the Infinite Way message, and helps the reader arrive at the truth that "That which I am seeking, I already am."